Hello, and welcome to Literature and History. Episode 2: Before the Flood. This program covers two Bronze Age Mesopotamian epics – the Enuma Elish and the Atrahasis - the earliest fragments of which are dated around 1700 BCE. In an essay called “What is a Classic?” the great modernist poet and scholar T.S. Eliot defines what makes a work of literature endure. This essay, published in 1944, attests that a culture must have reached a point of maturity in order to produce a work of literature that lasts for generations and generations. T.S. Eliot’s favorite classical writer possessed, in his words, “a refinement of manner, springing from a delicate sensibility.”1 This poet, Virgil, produced the Aeneid, which Eliot calls “Our classic, the classic of all Europe” (70). And Eliot adds, significantly, that “The bloodstream of European literature is Latin and Greek – not as two systems of circulation, but one, for it is through Rome that our parentage in Greece must be traced” (70). This is a common idea in the history of European culture – this notion that the artistic heritage of Europe can be traced back to ancient Greece – more specifically, the renaissance of Athenian culture that soared over the course of the 400s BCE, producing Aeschylus, Sophocles, Euripides, Aristophanes, Protagoras, Socrates, and a little later on, Plato. Looking backward into the heights of Classical Greece, T.S. Eliot attested that the main line of European culture had its genesis in the splendor of the Aegean world, some time around 500 BCE. T.S. Eliot (1888-1965) lived at a time when ancient near eastern literature was just emerging into the academic world, when it was still fashionable to trace the roots of European literature to Archaic and Classical Greece. But origin stories like this have an inherent problem. Origins have origins, as well, and the heights of classical Athenian civilization have roots in thousands of years of earlier cultures in the Fertile Crescent. Greek philosophy, after all, doesn’t begin with Plato in the 390s BCE. As far as we can tell it begins two hundred years before that, in the eastern Aegean, in the city of Miletus in present day Turkey, with the work of Thales, Anaximines and Anaximander, philosopher-scientists whose position in the Mediterranean allowed them access to the trade routes of Mesopotamia and the cultures of the Anatolian land mass. T.S. Eliot may have read Homer’s Odyssey, put into its current form some time in the late 700s BCE, and seen Homer’s story of a seafaring adventurer, clashes with monsters, and a journey to the underworld as entirely original. But tales of wandering adventurers date back at least to the Sumerian Epic of Gilgamesh and the ancient Egyptian “Story of Sinuhe,” both in circulation at least twelve hundred years before the Homeric poems. Journeys to the underworld – in the Sumerian Epic of Inanna and Dumuzi as well as Gilgamesh, also predate Homeric epics by many centuries. And the slaying of monsters, a fixture of Homeric poems and Greek mythology alike, abounds in a great deal of Bronze Age literature – the texts of the ancient Hittites, Babylonians, Assyrians, and on and on. So when T.S. Eliot writes, “The bloodstream of European literature is Latin and Greek,” we should remember, at the least, that Greek literature had an old and diverse bloodstream, and Latin literature, by the end of the first Punic War, was already a hodgepodge of Greek, Etruscan, Sicilian, Carthaginian, and native Italian traditions, all of which had their own tributaries and prehistories. Origin points have origin points, and tributaries have streams that feed them, and all of that’s fairly simple. But there is a more significant problem with Eliot’s commonplace emphasis that “The bloodstream of European literature is Latin and Greek.” And that problem is, in a word, the Old Testament. There are not, as I record this, a billion copies of Sophocles sitting on the shelves of a billion homes. There are, however, a billion Books of Job, Deuteronomies, Genesises, and printings of the Psalms. And these works, though they often have parallels to Ancient Greek literature, are not Greek. They are not Latin. The Old Testament, for the most part, is the product of a century or two of Judahite writers at work during and after the reign of King Josiah, who took the throne in 640 BCE. The language of these writers was ancient Hebrew. The cultural heritage of the Old Testament was a mishmash of Egyptian, Babylonian, Assyrian, and local Canaanite traditions – Ugarit, Edom, Moab, Ammon, Aram-Damascus, and others. These traditions predate the flowering of Classical Greek culture by centuries. And the Bible has indisputably been the most common text in European history. 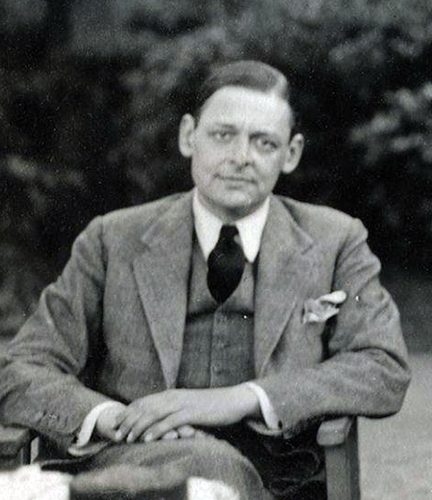 Further, although he was no stranger to the poetry of the Renaissance, Eliot does not seem to understand that the Anglophone poets he references so often in his work – Spenser, Marlowe, Marvell, Shakespeare, Ben Jonson, Milton, and company – Eliot does not seem to understand that these Anglophone poets did not have access to translations of Greek literature. All of them, however, had access to the Old Testament – its stories, its characters, and its ideology. These writers were, generally speaking, no strangers to Latin – Milton’s idol was Virgil, Shakespeare borrowed from the Roman playwright Plautus, Marvell wrote a famous ode modeled on Horace. But again, their smatterings of encounters with Latin were minute next to their exposure to the Old Testament. In Early Modern England, an aspiring poet might seek out a copy of Ovid or Juvenal. But as he walked across town to the bookseller’s, in most of the houses he passed, there was no Cicero, no Virgil, and certainly no Euripides or Sappho. In the houses that he passed, there were Bibles. About ten years after Eliot wrote the essay “What is a Classic?” the archaeologist and linguist Samuel Noah Kramer published a book called History Begins at Sumer. We talked about Sumer, last time – that civilization in the southeast of modern day Iraq that began developing urban centers in the 5,000s and 4,000s and came to a peak in the 2,000s BCE. Kramer’s book’s title – History Begins at Sumer – was perhaps intentionally provocative. In the mid-twentieth century, after all, there were Biblical literalists who took Genesis’ creation story at face value, and then there were academics like Eliot who saw Greece as the wellspring of European civilization and didn’t care to go further back than that. By the time Kramer published his book, History Begins at Sumer, however, cuneiform and hieroglyphics had been deciphered for a hundred years, and the archaeology of the 1910s, 20s, and 30s had produced such spellbinding discoveries that it was no longer possible to see Classical Greece as the fountainhead of European civilization, nor the Old Testament somehow standing apart from the literary and theological traditions that existed all around modern day Israel while it was being written. By the 1950s, for those stouthearted and curious minds who sought to learn more about the roots of European culture, there were more and more road signs and billboards, with more and more arrows pointing back into the literature of the Bronze Age – to Egypt, Anatolia, and most of all, Mesopotamia. It is silly to find any one culture or text as a singular origin point for another culture. Eliot could write, in 1944, that “it is through Rome that our parentage in Greece must be traced,” but, of course, parents have parents. Long before Classical Athens, the eastern Mediterranean was swarming with long boats and trading vessels, crisscrossing the Aegean, and the coasts of Cyprus, Egypt, Anatolia, and modern day Israel. The cultural parents of Classical Greece spoke a whole smorgasbord of ancient languages, and even before Hebrew, there was Ugaritic, Hittite, Aramaic, Akkadian, Sumerian, and on and on, into the undocumented past. Theologians and academics of Eliot’s generation like to think of instantiating moments – Classical Greece flashes up out of the obscure darkness of the Iron Age, or an Old Testament god suddenly creates landforms and populates a planet. But I think that by the time you finish Literature and History’s initial sequence of episodes on the literature of the Bronze Age, you’ll see that civilization did not have a single spark and blaze forth from there. I think you’ll instead see that the Eastern Mediterranean and the Fertile Crescent, all the way over to the Zagros Mountains at the modern day border of Iraq and Iran, all the way south along the Nile almost as far as Sudan, was a commercially and ideologically connected habitat. And within this habitat, the stories that survive in clay, stone, and papyrus have uncountable parallels with one another – stories of feuding generations of gods, of floods, of aquatic creations, of original sins, human hubris chastened by deities, shadowy afterlives, humans, fashioned of earth and water, and pantheon after pantheon that includes thunder gods, riding on clouds, war goddesses, and fearsome underworld deities. The Fertile Crescent, from 3,000, when we begin to have our first written texts, down to the Bronze Age Collapse of about 1,200 BCE and the two centuries afterward – during this time the Fertile Crescent was a broad and almost always interconnected crock pot of cultures and theologies. We have a general tendency as a species. We like to tell stories about why things are they way they are. And we like these stories to have definitive beginnings, and middles, and ends. We might not have the slightest idea about how an internal combustion engine works, or which vitamins and nutrients do what to their bodies, or how radio frequency waves transmit information. We might not have any idea about these processes that are around us every day. But that doesn’t stop many of us as individuals from adopting theories about the beginnings of the universe, the inception of life on earth, or the eventual fate of our species. It’s a strange habit – to ponder these unattainably distant things, and yet not know ten thousand closer and more relevant matters within the circuit of our everyday lives. We like to think about the beginnings and ends of things – their ultimate amplitudes and scopes. I think that we do this because our lives have beginnings, and middles, and ends. We move slowly across the X-axis of time, we increase in vigor and intellectual capacity on the Y axis, and then decrease, leaving behind us an arc of everything that we’ve been and done. It’s no wonder that we want everything – even the universe – to follow a similar curve. We want it to have a moment of conception, and a period of growth, a high noon, and then an inevitable decline. That it might be a long straight line, or many straight lines, or a series of spirals – all of these have proved less attractive than assuming that the universe has the same ultimate arc and lifespan as a human being's. When we read creation stories in combination, they reveal a relatively global human need to account for why things are the way they are, and assign a starting point to it all. Creation stories have common elements – water, darkness, then a god or gods creating the groundwork of the planet, then a god or gods mating and creating more deities, then humanity being divinely fashioned from earth, or something similar, humanity incurring divine wrath, and humanity repenting. Discoveries in astronomy from Copernicus onward have tended to spoil certain creation stories – for instance, it’s now difficult to argue that the earth is a piece of land on top of a great big turtle, or that the sky is part of the carcass of a defeated goddess. It wasn’t even four hundred years ago that Galileo committed the ultimate party foul, letting us all know that we are not, in fact, the physical center of the universe, and that we’re actually just kind of spinning around out here. But some creation stories are still alive and well. Stories like this one. In the beginning, everything was roiling, primordial of darkness. Then the waters and lands were separated. Then the dome of heaven was built. Great leviathans and monsters swarmed in the ocean, and God vanquished them. And after a time, God rested. Soon, humankind was made, fashioned both from clay and divine material, and after almost no time at all, people were compelled into an existence defined by physical labor. Yahweh fights the sea monster. An 1865 engraving by Gustave Dore. As time passed, God became increasingly displeased with the actions of man. A single, supremely pious man pleaded on humankind’s behalf, and asked for God’s clemency. God relented. Unfortunately thereafter, mankind’s errant ways continued, and God’s fury grew. Again the pious man interceded, and again God was persuaded to be merciful. However, as mankind continued to vex God, God planned a cataclysmic flood, and this time, no pleas for leniency were heeded. The pious man was given instructions to build a vast boat, on which he installed his family, and a huge variety of animals. The flood raged, obliterating humanity, and when it was over, the boat became lodged on a great mountain, surrounded by floodwaters on all sides. The pious man then sent forth birds, to see if they could find land, and when one of them did, he knew his tribulations were complete. Thereafter God and the pious man and his ancestors had a new covenant. The pious man made animal sacrifices to God, and seeing the sacrifices, God resolved to treat the pious man and his ancestors with justice and clemency. Sound familiar? What you heard, of course, was the story of Genesis up to Chapter 9. But it is also the story of the Mesopotamian Enuma Elish and Atrahasis, both a thousand years older than the Hebrew Bible. And peculiarly, although billions of people have heard the Genesis version, only a tiny, bookish minority know the creation narratives that came before Genesis, that probably influenced it. By the end of this program, you will be a part of that minority. Since the mid-nineteenth century, the elaborate parallels between Mesopotamian creation narratives and the creation stories in the Hebrew Bible have been studied, tabulated, diagrammed, and argued about by distinguished Assyriologists and staunch fundamentalists alike. And because the Old Testament is probably the single most important influence on Anglophone literature, and many people have actually read the Book of Genesis before leaving off around Chapter 30 when the story of Abraham’s descendants starts getting encyclopedic, it’s pretty cool to know what was floating around in the Late Bronze Age that may have influenced this important piece of writing. A tablet featuring part of the Atrahasis at the British Museum. So let’s get down to business. In the remainder of this episode, we’re going to look at first the Enuma Elish, and next the Atrahasis. Then we’ll examine some of the detailed evidence that suggests that there was a lot of cross pollination between Israel and Mesopotamia when the great creation stories of these regions were being produced. I’m going to quote a lot from these Babylonian epics, and the book I’m using is Timothy Stephany’s recent Enuma Elish: The Babylonian Creation Epic – a great modern translation. I’ll give you a one sentence summary of each Babylonian creation epic before we jump into one of them. The Enuma Elish, which we’ll cover first, tells of the creation of the world, a war between the oldest gods and their grandchildren, and the role that the great Babylonian god Marduk played in this conflict. That’s the Enuma Elish. The Atrahasis, which we’ll cover second, is about why the gods created man, the great flood that the wrathful gods made to purge the world, and Atrahasis, the man who figured centrally into this story, and is probably an earlier analog of Noah. So, first one, war of the gods. Second one, flood story. Let’s start with the first one - the Enuma Elish, Babylon’s creation epic, about a time when the world was young and raw, and deities conscripted demons in a great war with one another, and one young god emerged as the most powerful of all. Long, long ago, before there were any names for anything, quote “At a time when no divine beings had yet come into existence,” there were two divine beings, male and female, Apsu and Tiamat.2 Apsu and Tiamat intermingled their waters, and within these waters a sequence of Gods were born. First came the gods of the lands, then of the upper and lower spheres, then the god of the heavens, and finally, the god of the sweet waters which irrigate crops, Ea. Ea was respected by all, distinguished by his great intelligence and strength. 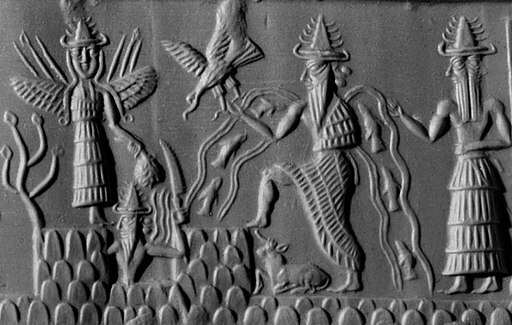 A cylinder seal impression showing (probably) the sun god Utu/Shamash (left) and Ea/Enki (center), god of wisdom and the sweet waters. Numerous other deities were born, and the younger generations of gods caroused, partied, had fun and made a lot of noise. They were youthful, the world was new, and it was time for feasts, music, and heavy drinking. And I’m not kidding about the heavy drinking. Mesopotamian fiction is filled with oceans of beer. Mesopotamians preferred barley beer to the marshy waters of their irrigated fields, so it’s not too surprising that their deities drank a lot of alcohol, too. Anyway, the celebrations of the younger gods did not go unnoticed. Tiamat, the mother of all the gods, complained to her husband Apsu. Apsu concurred that the kids and grandkids were way out of line. He admitted that he couldn’t even sleep with all the racket. Apsu and his officer decided to do something unspecified, but likely atrocious, to silence all of the raucous youngsters. The wise young god of the sweet waters, Ea, heard of this plan. Ea wanted to save his brothers and sisters from annihilation. After making some preparations, Ea chanted an incantation that made Apsu and his officer fall asleep. And then, Ea killed them both. Next, Ea placed the officer down over the dead body of Apsu, and took up residence on them. And the old patriarch Apsu, for the rest of history, was no longer a being, but a place. Everything was going really well for Ea, deity of the sweet waters that nourish crops. Ea had defended his generation of gods against oppression. Ea had used both cunning and strength to defeat a terrible conspiracy. Soon, Ea married, and his wife gave birth to Marduk, a singularly promising young boy. Marduk was handsome and seemly. He had four eyes and four ears, and flames roared out of his mouth when he opened it. Just imagine how proud you would be if you had sired a fire breathing son with such unusual facial features. I, personally, would be speechless. Marduk, the star of the Enuma Elish. From a Babylonian cylinder seal. Ea and his son Marduk were indeed content. They now had a place called Apsu to live in. One of them even made the four winds, and the tidal swells. What could possibly go wrong? If you’ll remember, Apsu, whom Ea had killed in self defense, had a wife. Her name was Tiamat, and she was still alive, and she was very angry. Tiamat was not only ireful about her husband’s murder. She continued to be vexed by all the racket the young gods were making. Now there wasn’t just the aggravating, noise of all the younger deities. They’d even made a bunch of winds and tidal swells to irk her further. Tiamat was angry. She vowed revenge, and built an army of gods and demons. Ea, wise young god of the sweet waters and father of Marduk, heard of the great Tiamat’s big, terrifying army. The other gods told Ea that it was his fault that Tiamat was seeking vengeance. Ea had, after all, butchered her husband and made his carcass into a giant land mass. Ea had few rebuttals to these accusations. At his own father’s orders, he went to confront Tiamat and her forces. Two times he went, and both times Ea backed down. Ea’s father was ashamed at his son’s cowardice, and so the old man asked Marduk, his grandson, for aid. And Marduk agreed to spearhead the attack. All the younger gods breathed a sigh of relief. They had a feast, and they “slurped up flavorful beer through drinking straws / And were made full through the consumption of alcohol” (23). Somehow, even though Tiamat and her giant horned snake and dragon and minotaur and – uh – fish man were all planning their imminent destruction, the intoxicated younger gods still had time to construct Marduk a royal palace. After their drinking slash building binge was over, it was time for the younger gods to join forces, and deal with Tiamat. The younger gods declared Marduk the paramount deity. They gave him an arsenal of weapons. He had a powerful bow. Marduk had a net, designed to ensnare any foe. He was given a mace so vast and powerful that it could cause floods. Marduk buckled his weapons on. And then, bristling with armaments, and at the helm of a chariot driven by venomous horses, Marduk was ready for a fight. An Assyrian relief showing a deity, possibly Marduk, fighting a lion headed creature. In an initial sally against Tiamat, the evil matriarch used a magic spell to try and persuade Marduk to put down his weapons. But the young hero wasn’t fooled. In a brief fight, Marduk used his net, his mace, and then his mighty bow on Tiamat, weakening and then killing her. After chopping her to pieces, he slaughtered her general and neutralized her demons, and then hung up half of her carcass to serve as the heavens. In fact, he disassembled her thoroughly. Her liver became the sky’s summit, her head the mountains, her eyes the Tigris and Euphrates, and her venom became the mists. To cap off his victory, Marduk built a grand temple called Esharra. But this temple wasn’t his final construction project – Marduk told the gods he would build his own personal home, called Babylon. The gods then created mankind. Side note. Since Atrahasis deals with man’s creation more extensively, and since the story of our creation is very similar in the Enuma Elish and the Atrahasis, I’ll get to mankind’s creation in the next section. What you just heard was a widely circulated story – whose oldest fragments, again, date back to the Old Babylon of Hammurabi – around 1700 BCE. It may be older than that. Marduk was the principal god of Babylon, and the deity for whom Etemenanki, or the Tower of Babel was built. In a sentence, the Enuma Elish a sort of creation narrative for monotheism itself, and the slow turn in Ancient Near East religion around the close of the second millennium BCE from worshipping nature deities of waters and trees and mountains to revering distant, supersensory gods that exist beyond the material world.3 Like Zeus, and Yahweh, Marduk fought primordial forces and imposed a patriarchal order on the cosmos. A cylinder seal impression of a heroic figure battling a sea creature. And those two quotes are from Chapters 38 and 42 of the Book of Job. In the moment that the speech is delivered to Job, it’s a famous logical non sequitur. It doesn’t answer poor Job’s question – it only, after forty chapters of philosophical discussion, overwhelms Job with imagery of God’s power. Maybe part of the reason why Iron Age readers found the Book of Job’s climax to be satisfying was that the story of a singular young divine hero, rising out of a pantheon to tackle an oceanic nemesis, was an old story – a powerful story that had been around since the Middle Bronze Age – a story so wired into the consciousness of the Ancient Mediterranean that you just didn’t question it. The Enuma Elish’s tale of a youthful storm god going up against elemental deities can be found all over the Bronze Age fertile crescent. Let me give you some examples. Hesiod’s Theogony, which we’ll get to in a few episodes, is about Zeus taking on his father Kronos, then establishing the hierarchy of Mount Olympus and then procreating with an astonishing number of deities and humans in order to sire other deities and beings. 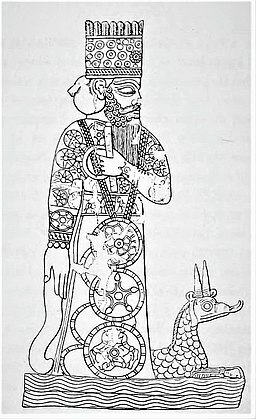 The Hittite Kumarbi Cycle, dated to the 1300s BCE and discovered in modern day Turkey, is about a young deity called Tessub fighting off his oppressive father and his viceroys. The Ugaritic Baal cycle, also dated to the 1300s BCE, and discovered in modern day Syria, tells of the storm god Baal fighting the Litan, or ocean – a primordial deity not unlike the Leviathan that Yahweh recollects fighting in the Book of Job, and even having a similar name. So, whether Zeus to the west, Marduk in the east, Tessub to the north, and Baal to the immediate northwest, ancient Israel was wreathed by cultures that told of watery creations, and young gods, associated with the sky and storms, fighting off older gods, associated with earth and water. It’s always interesting to see parallels to the Old Testament. And from a broader historical perspective, it’s equally interesting to hear so many similar cultures telling tales about generations of gods. Maybe, during the Indo-European migrations that swept through the ancient world from 4,000-1,000 BCE, as peoples from the Caucasus came down into modern day Iraq, Iran, Israel, Syria, and Greece and brought new pantheons with them – maybe all these stories about different generations of gods are also stories about encounters between different groups of Bronze Age peoples. As the polytheistic systems of indigenous populations were spliced together with those of new migrating groups, perhaps all these stories of generations of gods helped explain some of the theological transitions and cultural changes experienced by generations of ancient people in the Eurasian world. At their fateful meeting, the gods decided that “We must create a creature who can carry the burden of the gods” (62). In order to accomplish the creation of man, the womb-goddess combined clay together with the flesh and blood of another god. Thereafter, humankind was created, described as a “being, divine and mortal” (67). Once humans were created, the gods determined certain basic parameters about how our species would function. The gods set forth regulations concerning marriage, the term of a pregnancy, fidelity and piety, and honesty. Because the gods created humankind for the sake of labor, a heavy emphasis was placed on the necessity of humanity being dutiful and industrious. A particularly beautiful simile about insects illustrates how the human species is inexorably tied to labor. With proverbs and epic similes, the gods established the roles and duties of humanity, and thereafter the first generations of mankind began swarming over the face of the earth. Six hundred years passed, and humankind was a busy, boisterous species. We were so boisterous, in fact, that we began annoying Ellil, the aforementioned ireful war councilor of the gods. Just as Ea and his generation annoyed Apsu and Tiamat in the Enuma Elish, in the Atrahasis, it’s humankind who prove aggravatingly loud to the gods. In a passage repeated a number of times, after mankind was first created, quote “the inhabited lands raised a howl like a bellowing bull” (73). This cacophony prevented the god Ellil from sleeping. Ellil decided that he would strike mankind down with “an outbreak of the shivering disease” (73). So what happened to mankind? Having incurred the wrath of a martial god, to whom could they turn? It’s time to introduce the essential cast of Atrahasis. First, picture an upside down triangle. At the bottom of it is the title character. Patient, unerringly pious, hardworking, and dutiful in his sacrifices, Atrahasis is the human hero of the story. On one of the upper corners of the triangle is evil Ellil, the volatile war councilor god who would just as soon wipe out humanity. And on the other upper corner of the triangle is the god of the sweet waters, Ea, the sagely old father of Marduk, who campaigns tirelessly on the behalf of humanity. The story of Atrahasis is fragmented, complex, and repetitious, but ultimately it’s about one god, Ellil, wanting to persecute humankind, another, Ea, championing mankind, and the human figure at the center of all of this, Atrahasis. Evil Ellil, gentle Ea, and the human Atrahasis. Back to the story. The martial god Ellil got his way, and humans were plagued by a terrible sickness. Ea, the wise father or Marduk, told Atrahasis that humanity should rebel, stop working, and stop sacrificing. After people did this, the disease remitted. If you were an Ancient Near Eastern god, whether Greek, or Israelite, or Canaanite, or Babylonian, you needed those meaty sacrifices. So, once the gods got their sacrifices again, the numbers of humanity could continue to grow. So from on high, no rain descended to fill the canal works. During this long drought, people resorted to cannibalism, and still, Atrahasis sent his sacrifices down the withering canals to his god Ea. Finally, Ea sent rain to the desperate lands. And Ellil was incensed. He demanded that Ea cause a cataclysmic flood. Hence begins a story that many people Noah – I mean . . .know. Hint hint. Ellil demanded a flood so overpowering that the gods “will retreat to the safety of the highest heaven. . .Where they will cower like dogs, kneeling by an outlying wall” (94). The council of the gods approved of the flood. Ea then went to Atrahasis – and told the pious man to construct a boat, giving him very specific instructions on how to do it. Over the course of a week, Atrahasis and his townspeople built a boat an acre in size. They stocked the ship with animals and skilled craftsmen, and Atrahasis, after he regaled his townspeople with food and drink, was terribly saddened that they would all be destroyed by the flood. Then the flood began. The narration conveys its terrifying power. Overhead the sky resounded; all of the people gazed aloft. . . They lost sight of one another within the cascading rain . . . The gods became distraught at the destruction they had unleashed. The midwife goddess, Mami, who helped raise the first generations of mankind, was particularly saddened, and “The gods joined her in weeping for the vanished country / She was overcome with heartache, but could find no beer” (101). Yes, it really says that. It’s one of the funnier lines of the story, and I wrote a song about it that I’ll play at the end of the program if you want to hear it. So, poor Mami couldn’t find any alcohol, and all the gods were all realizing that the flood had wiped out their labor force. Fortunately, humankind wasn’t altogether exterminated. Although the whole earth perished beneath the waters, Atrahasis’ boat survived. Looking out at the horrible destruction all around him, he wept. His boat settled on the side of a mountain called Ninush. Worried that all other land in the world was gone, Atrahasis sent out three birds, a dove, a swallow, and a raven, and when the raven did not return, he knew it had found land somewhere. You now know the overall structures of two Mesopotamian creation epics, partner stories to the beginning of the Old Testament. Let’s get into a bit of detail about the timeframes in which these Akkadian and Hebrew creation stories were composed, and some of the more memorable similarities and differences between them. A map of Mesopotamia. Note the locations of Babylon, where the Judahites were held captive between 586 and 539, Assur (the later Assyrian capital further up the Tigris) and Jerusalem. The clay tablets on which we have the fullest versions of the Enuma Elish and the Atrahasis were impressed during the 600s BCE, but the stories captured in them were circulating during the previous millennium, again as far back as 1700. The bulk of the Hebrew Bible is thought to have been composed between the 700s BCE and the end of the Persian period in 323, with a particularly heavy amount of work being carried just before and during the Babylonian captivity, or roughly 640-540 BC.5 Lots of dates, I know, but for our purposes, let’s just say this. Genesis was being produced at the same time, and around the same places the Enuma Elish and the Atrahasis were being copied in Babylon. During the fifty years the Israelites were in Babylon, the scribes who wrote, copied, and edited Genesis, Exodus, Leviticus, Numbers, Deuteronomy, and the Talmud were in the same city-state with the Enuma Elish and Atrahasis. The Babylonian creation story was written in Akkadian, a Semitic language that the Israelites had, by necessity, to understand at least a little of in order to function in the Mesopotamian world. Let’s talk about some of the overall parallels between – the Babylonian and then the Old Testament accounts of our creation and the subsequent deluge. I want to go through three comparisons that I think help illuminate both the Mesopotamian myths and the Hebrew bible. 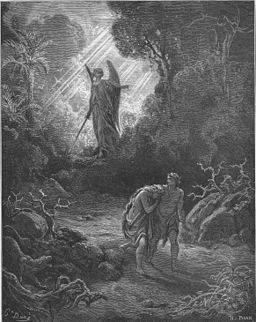 Gustave Dore's illustration of the exile of Adam and Eve from Eden (1866). First, in the Book of Genesis, when Adam and Eve are created, they seem to be created merely to do light pruning work and generally enjoy one another’s company. We’re not actually told why humankind is made – just that they are. Contrastingly, in the Mesopotamian stories, humans are created deliberately to fill a dire demand – the gods need a being who can and will reliably work. We’re a sort of drudge class, or cosmic proletariat, permitted to exist due to our ability to take a beating and continue sacrificing, and making beer. It is true that at the end of Genesis, once paradise is lost and Adam and Eve make their way out of Eden, they have to win their bread by the sweat of their brow. But this is punishment for eating from the Tree of Knowledge. In Atrahasis, on the other hand, there is no original sin. We work because that’s what we’re made for. It’s no punishment. I should add that the Mesopotamian stories you’ve just heard have inspired a fun alien conspiracy story that a race called the Annunaki – that’s a word for a certain caste of Mesopotamian gods – were an alien species who genetically engineered mankind to dig canals and plant date palms and make beer for them. Genetically engineered to make beer for a vastly superior race. It’s a pretty humble way to look at ourselves, if you think about it. 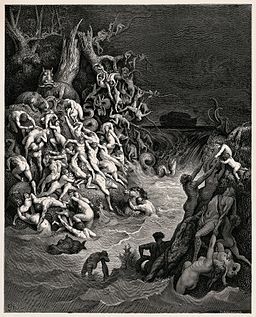 Gustave Dore's illustration of the horror of the Biblical flood (1866). For a third key parallel, we need to look at a different book in the Old Testament – Numbers. This book of the bible follows the seesawing pattern of the central part of Atrahasis. In other words, mankind offends god, then a leader character (be it Moses or Atrahasis) intercedes on behalf of humanity, and god shows mercy, only to become incensed anew by some novel crime or act of disrespect. Read chapters 11-14, chapters 16, 20, and 21 of Numbers and you will see the poor Israelites again and again erring, being subjected to God’s wrath, and then being saved by Moses’ intercessions. This is the cycle that takes place in Atrahasis, and many biblical scholars believe that the reason the Old Testament God is so alternatingly violent and then kind and generous is that the stories told about him were adapted from older polytheistic traditions, in which multiple gods like Ellil and Ea sparred with one another over the question of what to do with mankind. While these are important differences between the two flood stories, the similarities between them are so plentiful that it’s difficult to argue that the tale of Noah did not spring from the earlier Akkadian narrative. Both stories feature a god giving a mortal very specific architectural instructions for creating a giant boat and filling it with animals. Both describe the catastrophic flood with colorful specificity, emphasizing the extent of the eradication of life on earth. Both tales feature the boat captain running aground on a tall mountain. Both stories feature the boat captain sending out three birds in succession – in the Atrahasis it’s a dove, swallow and raven and in Genesis Chapter 8 it’s a raven, then dove, then dove again. Both feature the boat captain preparing meaty sacrifices, and gods smelling the barbecue and coming to see what’s cooking. And both end with the deities, ingratiated by sacrifices, promising to be gentler and more steadfast and making a covenant with mankind to do so. Just about everything I’ve told you today was forgotten for two thousand years. It lay on stone tablets buried in ruins in Iraq and Turkey. When people first learn the Enuma Elish and Atrahasis, they have a sense that they’re hearing some obscure stories that wriggled around for a little while before the real heavyweights got rolling – the Old Testament, and Homer, and so on. Let me just remind you of something to put it all in perspective. For a long time, Babylon was nothing more a broken heap, said by the locals a hundred miles south of Baghdad to be haunted. Its Ziggurat, Etemenanki, built to honor Marduk, is still a pile of rubble. Its cuneiform history, and religion, and literature lay undeciphered and forgotten. Since the Greek historian Herodotus, we’ve known about the city’s immensity, but for a long time, it was mostly just a name. It was not a good name. The Old Testament tells of the destruction of Judah by Nebuchadnezzar II, and the subsequent Babylonian captivity. The New Testament’s book of Revelation contains a famous description of the Whore of Babylon – a bloated, decadent figure of ruination and imperial excess. This Babylon in Revelation, however, has nothing to do with the Babylon that told the stories about Marduk and Atrahasis we heard today. The Greek speaking authors who produced the Book of Revelation in the first century CE had little in common with their Hebrew speaking counterparts who had lived in the real Babylon over 500 years before. The Whore of Babylon, most readers agree, was Rome, or perhaps Jerusalem. The Whore of Babylon had little connection with the cosmopolitan city that had served as the cultural heart of Mesopotamia for centuries of ancient history. In the past fifty years, Babylon and its memory have continued to be abused. In the 1980s, Sadaam Hussein reconstructed some of Babylon, in reckless abandon of the methodology of modern archaeology, consequently burying layers of artifacts underneath his new facades. Little different than other Ancient Near Eastern kings, Sadaam Hussein glorified himself there, in stone, having his name carved in processional bricks as a legitimate son of Nebuchadnezzar II, Babylon’s greatest king. After America invaded Iraq in 2003, US forces built a military base there, destroying stonework and undertaking earth moving projects that hurled archaeological objects wherever they happened to fall. I try and picture what it would have been like for a person who lived in Nebuchadnezzar’s Babylon, or Nabonidus’ Babylon, to be brought forward through time. I imagine, maybe, a woman who had been raised amidst the broad boulevards and terraced plots, amidst graceful stone carvings and water gardens, in an elegant, educated city that cared about its 2,500 year old cultural traditions – a woman who perhaps even had friends in the small population of exiled citizens of Judah – and spoke a bit of their language, and shared stories with them. I wonder what it would have been like for her, to be brought forward to 2008, and see military vehicles cracking the forgotten paving stones of her streets, and know that to the southeast, in the modern city of Basra, explosions were being caused by strange metal things that ripped through the sky. I wonder what it would have been like for her to hear that, in spite of the fact that Babylon was once the most beautiful, and populous, and cultivated city in the world, all that most people remember about Babylon is a mass kidnapping and a reference to a whore. I think she would be absolutely, understandably devastated. And I hope that in my lifetime, we will see Babylon become an international tourist attraction to rival Athens, or Rome, or Giza, because it is as important as any of them, and easily a contender for the greatest city in human history. But we have a long way to go. In 2014 the organization called ISIS or ISIL occupied the museum in Mosul, in northern Iraq. This museum is the second largest in country. Parked near Nineveh, the Mosul museum is at the heart of Assyria, Babylon’s brother civilization in Mesopotamia. The Mosul museum had already been looted in 2003. But the destruction of artifacts there in 2014 shocked all of us who saw footage of it. Watching black clad men with sledgehammers and circular saws laying waste to winged bull statues, and palace walls, and other artifacts was horrifying for all of us who know even a little about the history of ancient Iraq. It’s one thing to hear Biblical, or Qur’anic proscriptions against idolatry. To see the great stonework of proud Assyria pulverized, or to think of the statues and inscriptions of beautiful Babylon being broken and defaced – that’s another matter. We who are the historical heirs of Judaism – and this includes Christians and Muslims – we all have trouble with Mesopotamia. Mesopotamia often humbles us. That doesn’t stop the overwhelming majority of us, whatever our religion, or lack thereof from feeling sick to our stomachs when we see archaeological treasures being obliterated. But still. The knowledge that the Old Testament only came along at the halfway point of recorded human history, and that the singularity of the Old Testament might not be so singular – this knowledge continues to remain surprisingly esoteric. The winged bulls of Assyria, and the vast reaches of the Babylonian ruins, however much they have been maimed and disfigured, are still a reminder that a long, and complex, and urban history predated anything that we ever knew about, up until ridiculously recently. And while the ruins and artifacts of ancient Iraq continue to be vulnerable to the vagaries of history, thank goodness that over the past two centuries like minded Ottomans, and Iraqis, and foreigners have been recovering cuneiform tablets there, and learning to understand the stories written on them. Stories, after all, are quite a bit harder than stone. So if the Enuma Elish and the Atrahasis seem like exotic preludes to more familiar stuff, then let me say, again, that these are not colorful peripheral material. These are fragments of the beginnings of religion in the central Eurasian world as we know it. They are the narratives that Jews, and Christians, and Muslims can stand shoulder to shoulder and read together, a shared cultural tap root that lies behind the Abrahamic religions, and a reminder that while our theologies have differences from one another, these theologies come from the surprisingly cosmopolitan and interlinked bedrock of the Bronze Age. So we’ve covered the Enuma Elish and the Atrahasis, great tales of Marduk and Tiamat, and Ea and Ellil. We’re not forgetting anything, before we leave Mesopotamia, are we? No, we couldn’t possibly. Wait, I hear music. [Gilgamesh vocal theme.] Oh, yeah. Gilgamesh. 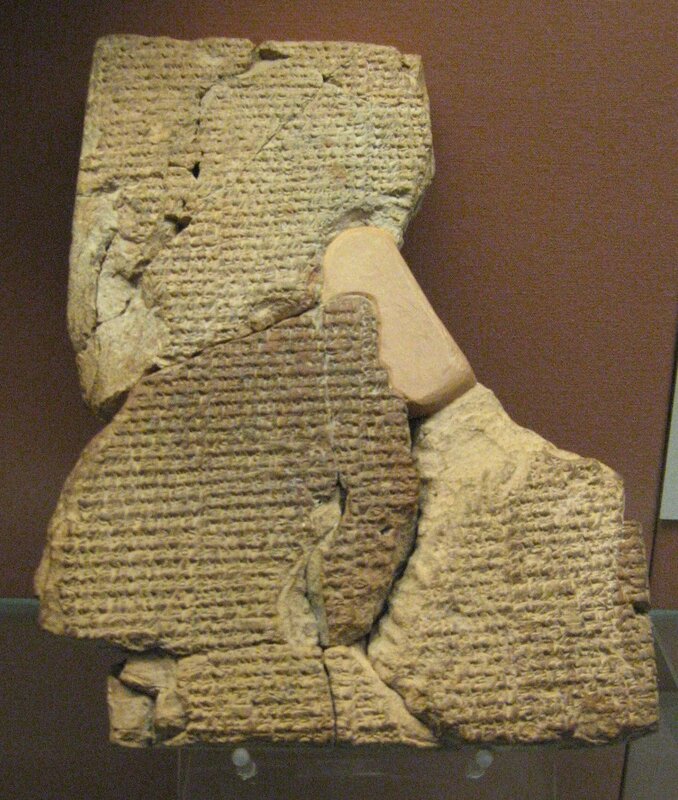 Next time we’re going to talk about the Epic of Gilgamesh, a story whose fragments were widely distributed enough in the Fertile Crescent that we suspect even the average Mesopotamian knew about it. It’s a great story, a view into the psyche of the ancient world, it contains more analogues to key elements in the Old Testament, and it’s probably the only text from the Bronze Age to – almost – be a household name. So, try a quiz on this episode at literatureandhistory.com if you want to test your memory of the Enuma Elish and Atrahasis. If you want to hear a silly song about Babylon’s alcoholic gods, I have one coming up. And if not, thanks for listening to Literature and History, and I’ll see you next time. Still here? Alright. Well, I got to thinking about the funniest sentence in the Atrahasis. At the moment when the flood has finished wiping out humanity, the midwife goddess, Mami, is suddenly crushed with sadness. As the Atrahasis reads, “The gods joined her in weeping for the vanished country / She was overcome with heartache, but could find no beer” (101). It’s a terrific moment – the gods suddenly feel guilty about killing us all and they want to drown their sorrows. And so, because I couldn’t get the phrase “She was overcome with heartache, but could find no beer” out of my head, I wrote the following song, which is called “Mami’s Song.” I hope it’s entertaining, and Mr. Gilgamesh and I will see you next time. 1.^ Eliot, T.S. On Poetry and Poets. Faber & Faber, 1957, p. 63. Further references noted parenthetically. 2.^ Stephany, Timothy. Enuma Elish: The Babylonian Creation Epic. Kindle Edition, 2013, p. 3. Further references noted parenthetically. 3.^ Simo Parpola and Jerrold Cooper have written somewhat differently on Assyrian Ashur and the move from polytheism to monotheism in ancient Mesopotamia, although both agree that the consolidation of "gods" in Mesopotamian polytheism into a single verbal unit gave Mesopotamians a simple noun to describe an entity that determined people's fates. See Kriwaczek, Paul. Babylon: Mesopotamia and the Birth of Civilization. New York: St. Martin’s Press, 2012, p. 230. 4.^ Quoted in Coogan, Michael D.; Brettler, Marc Z.; Perkins, Pheme; Newsom, Carol A.. The New Oxford Annotated Bible with Apocrypha: New Revised Standard Version. Oxford University Press. Kindle Edition, pp. 765, 769. 5.^ The Song of Deborah in the Book of Judges, often thought the oldest portion of the Old Testament, makes reference to an unconquered Israel, and thus was likely composed prior to the fall of Samaria in 722 BCE to Assyria. The last books of the Old Testament were written well into the Hellenistic period - Daniel, likely, around the end of the Maccabean revolt in the late 160s. 6.^ See NOAB, p. 19n.